Have you ever met your 'lost cousins'? 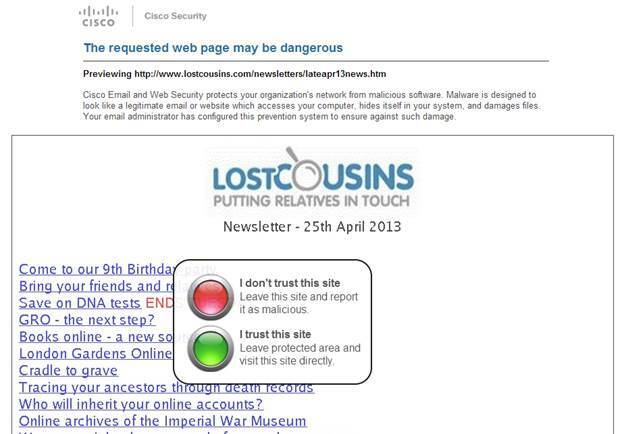 The LostCousins newsletter is usually published fortnightly. To access the previous newsletter (dated 25 April 2013) click here, for an index to articles from 2009-10 click here, for a list of articles from 2011 click here and for a list of articles from 2012-13 click here. Good news - I've been able to negotiate an exclusive discount code for readers of this newsletter. 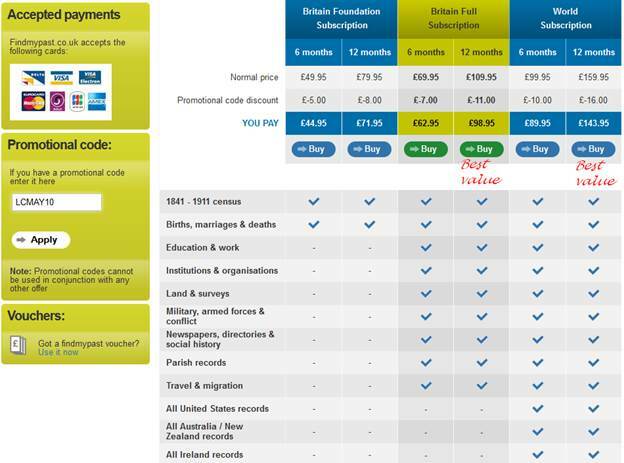 You can save 10% on any new findmypast.co.uk subscription! Whilst this offer doesn't apply to subscriptions to other findmypast sites around the world (findmypast.com, findmypast.ie, or findmypast.com.au) the UK site is the only one that currently has ALL of findmypast's British records. It's also the only site where you can search the British records using the traditional search that most of us are used to, so even if you had to pay a little extra to subscribe to the British site it would be well worth it. Remember that if you need to access records from Ireland, Australia, or the US you can do so from the UK site with a World subscription. Tip: if you want to share this offer with other researchers, don't simply pass on the code. Instead, please send them a link to this newsletter - that way they might be inspired to link up with their own 'lost cousins'. (3) Choose the subscription that's best for you, bearing in mind that 12 month subscriptions offer by far the best value (because the second 6 months is almost half price). I've marked the subscriptions I recommend in the screenshot above. The World subscription includes Ireland, Australia & New Zealand, and the USA (click on the country name to see precisely which records are included). If you're only interested in British records the Full subscription is by far the best choice - the Foundation subscription only offers basic records and is therefore most suitable for beginners. The wealth of additional datasets you get with a Full subscription are well worth the small additional cost, especially when you consider that a subscription to just one of them - the newspaper collection - would cost £79.95 if purchased separately. This week's New Scientist reports research suggesting that the languages of Europe and Asia have all developed from a common language that existed at the end of the last ice age, about 15,000 years ago. The proposed link between languages as diverse as Inuit, Japanese and Greek is controversial but intriguing. At the same time Nature reported DNA-based research which suggests that any two Europeans are likely to have many common ancestors who lived around 1,000 years ago. If you want to know more these FAQs go into a lot more detail (the technique they used seems to be similar to that used by Family Tree DNA with their Family Finder test). Of course, as family historians we need to know not only that there's a connection, but also what the connection is - and that's the real challenge. I am probably related to William the Conqueror, just as you are but, if we can't come up with the historical records that demonstrate the connection, it can't become part of our family history. The aim of LostCousins is to connect members researching the same ancestors so that that you can share information with your cousins - and also, perhaps, collaborate on future research. Nobody expects you to physically meet your cousins, and in any case because one-third of the matches are between members on different continents there are many cousins who could never meet face to face (though I suppose that now you can make free video calls using services such as Skype the definition of face to face is changing!). Over on the LostCousins forum there's been a debate going on about the merits of actually meeting up with a 'lost cousin'. I haven't met most of the 'lost cousins' I've found, but I must say that those I have encountered have all turned out to be delightful (I can only hope their impressions of me were similar!). Gillian wrote that "One of the most moving moments of my life was squatting by the grave of our 5xgreat grandfather, who died in 1745, with my sixth cousin". I think a lot of us would love to have an opportunity like that - I know I would. But what about you - have you ever met up with a 'lost cousin'? The members who email me with the best stories will get an exclusive pre-launch invitation to join the forum so that they can post them there. A month ago, with little fanfare, the National Library of Wales made available an online index to thousands of crew lists and other documents for 544 merchant vessels registered in Aberystwyth - there is an entry in their blog on April 15th. Note: I originally thought that the images were online - this turns out not to be the case. Tip: there are transcriptions of over 33,000 crew lists at findmypast. The day after I published my last newsletter the National Library of Wales, which also holds wills, parish registers, and many other documents of importance to family historians, was struck by a fire which destroyed part of a roof. Some of the collections suffered damage, but it isn't yet clear what records were affected. A firm of funeral directors in the West Midlands is looking for the next of kin for 150 urns containing ashes of the departed (see this BBC News story for more details). Most of the urns date back 20 years or more, and one goes back to 1953! They plan to scatter the ashes if nobody claims them as a result of this latest appeal - according to an article from last year the National Association of Funeral Directors published guidelines in 2011 stating that unclaimed ashes must be stored for at least five years, with efforts being made to locate the rightful recipient, before a funeral company could dispose of them. We have selected an area within the Cemetery that we are calling the “Heritage Area” in which we intend to extinguish the rights of burial, remove memorials, increase the space for burials, and re-use the graves. The City of London Corporation may do this in accordance with Section 6 of the City of London (Various Powers) Act 1969 and Section 74 of the London Local Authorities Act 2007. These graves are located in square's 21, 22, 36, 37, and 52, and will be marked accordingly within the cemetery grounds, these square numbers are shown on our cemetery map. Somewhat unhelpfully the link to the map of the cemetery that they provide doesn't work, but I managed to find a copy here. If relatives object then the burial plot will be left untouched for at least 25 years - but that depends on the relatives being aware of what's happening. The official notice only lists the plot numbers, not the names of the occupants or the owners. To ascertain whether any of my relatives, hundreds of whom lived in east London in the late 19th and 20th centuries, are buried there is virtually impossible - the burial registers are unindexed. The cemetery charges £100 per name per year if the exact date of death isn't known, and £25 even when it is, so it would cost thousands of pounds to check whether any of my relatives are buried there. "is not really a practical one as almost all of them no longer have a memorial on them. The memorials on these graves were cleared in the 1950s and 60s as the graves had become dangerous and derelict, and the owners could not be traced at that time following a similar process to the one we are following now." "It is also important to note that the 205 graves that are currently listed are the latest phase in what is now some 1800 graves that the City of London has extinguished the Rights of Burial on since 2003 and this number will increase as the process continues, making the current process the only practical way forward for us." Clearly matters are only going to get worse - unless changes are brought in. Ironically a few years ago the cemetery staff began scanning the registers and putting them online, but they only managed 1856-61 before the project was put on hold. Surely it's about time the law caught up and made it compulsory for cemeteries to index burials and make the data available online before digging up remains and moving or destroying memorial stones? Kathy noticed a short note at findmypast which indicates that "14,242 parish burial records from St Nicholas / Hanover Chapel, Brighton, Sussex will be removed from findmypast.co.uk on 27 May 2013". This means you've got little more than 2 weeks to look for any of your relatives! It's unusual that records are removed - we're more used to them being added. I imagine there's a story behind the announcement - for example, it may be that the correct permissions weren't obtained by whoever transcribed the records. We all know that historic birth, marriage, and death certificates sometimes include erroneous information - indeed, when it comes to 19th century marriage certificates it would be more appropriate to say 'often'. Even today errors are still made occasionally, most commonly on death certificates, but until Chris wrote to me recently I didn't know how difficult or expensive it would be to arrange for an entry to be corrected. Chris's mother died of a stroke, but when Chris subsequently took a DNA test he discovered that he had a mutation involved in Haemachromatosis, a hereditary disease that results in excess iron accumulating in the body. Taking into account his mother's other symptoms, it because clear that it was this previously undiagnosed disease that had been the true cause of his mother's death - and as Chris had inherited the mutation he understandably wanted his descendants to be in possession of the facts. At this point I wasn't sure if it would be possible to make a change, but I suggested that Chris contacted the GRO - who recommended that he complete this form and provide a letter from the doctor who had certified the death explaining the error and stating what the cause of death should be. I decided to research further to see what other forms exist, and what other changes can be made. I found quite a collection! If you want to see what's available start here on the GOV.UK website - it has links to forms for adding the father's name to a birth record, and correcting birth, marriage, or death records, but you might also find some of the other information of interest. 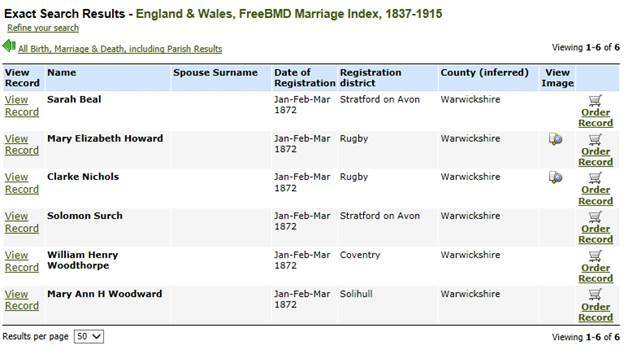 If you are, or have been, an Ancestry subscriber you'll be aware that their indexes of England & Wales Births, Marriages, and Deaths from 1837-1915 were sourced from FreeBMD - and you'd therefore expect their indexes to be at least as accurate. Indeed, when I searched for marriages in the 1st quarter of 1872, specifying the volume as 6d and the page number as 569 there were 6 results compared to just 2 at FreeBMD - so on the face of it Ancestry was producing better results. However, when I looked more closely I realised that the 6 results included marriages from 4 different Registration Districts - which is impossible because all the entries on a page should be from the same district. You can also see that only 2 of the records are linked to an image, which suggests the others are completely spurious (mind you, it seems that wouldn't stop Ancestry from charging £22.99 for a copy of a non-existent marriage certificate - the Order Record link worked). I was alerted to this problem when June contacted me - she was trying to find the marriage of her great-grandfather Solomon Surch. That's such a rare name that it ought to be easy to research, yet whilst FreeBMD and findmypast show him as marrying Eliza Gibbins in 1887, Ancestry show him marrying Sarah Beals in 1872. You can imagine how confusing this was for June, particularly since Solomon was shown as a bachelor when he married Eliza! Of course, you have to expect the occasional transcription error - but in this case Solomon Surch's marriage had been displaced by 15 years, so it clearly wasn't a transcription error. It got worse when I looked closer - the entry for William Henry Woodthorpe should have been recorded as 1905, not 1872 (a 33 year difference). These are not transcription errors - the data has clearly been corrupted, and whether the corruption is accidental or deliberate it represents a dangerous trap for family historians. I did wonder whether these might be isolated incidences, but many of the other marriage entries that purport to relate to 1872 are from other years - for example, John S H S J Morphett who actually married in 3rd quarter of 1915 is shown by Ancestry as marrying in 1872, 43 years earlier. In all, Ancestry lists 1,163,440 people who married in 1872, but only about 400,000 in each of the years on either side. This suggests that around 750,000 1872 entries are bogus, an incredible number - and worse than that, they're almost certainly missing from the years where they actually belong. There are other problems with the GRO indexes. For example, if you fast forward to 1972, almost 3000 births registered in Portsmouth are ascribed to Oxfordshire, and there are similar problems in other years (thanks to John for pointing this out); over 25,000 births registered in Brighton are attributed to Hampshire. John tells me that he's been complaining to Ancestry for 4 years about these problems - but I trumped this by explaining that 7 years ago I pointed out that 72,000 people on the 1881 Census are incorrectly shown as living in Harmmersmith - and that's still not been put right. Ironically it's one place name that Ancestry certainly ought to have known how to spell - because their UK offices are in Hammersmith! I recently stumbled across some interesting articles from the Blackburn Standard, 21st July 1900 edition, which I thought might be of interest to readers of this newsletter. Note: the clipping is reproduced with the kind permission of the British Newspaper Archive; the image was created courtesy of the British Library Board. You can get 15 free credits when you register for the first time at the British Newspaper Archive. The first article was somewhat surprising - but having heard so much about King Edward VII's dissolute life as Prince of Wales it perhaps shouldn't have been a great surprise to read that his wife banned intoxicating drinks from the dinners celebrating Queen Victoria's Diamond Jubilee in 1897. But the reason I spotted the article was the gobbledygook in the penultimate sentence - I wonder whether anyone can tell me what it signifies? There's a free LostCousins subscription for the first correct answer! However, it's amazing how one things leads to another, and coming from Essex the bottom article was a real bonus. An automatic ringer for church bells - it's like something out of Wallace & Gromit! I tried to find a copy of the patent to make sure that it wasn't an April Fool joke that had been innocently repeated, but without success - I wonder if any evidence of the machinery still survives in the church? These articles are a good example of the serendipitous discoveries that we can make when we're not constrained by credits! You can access more than 6 million pages from the British Newspaper Archive if you have either a Full or World subscription to findmypast.co.uk (see above for details of the current discount offer). After circulating the 60,000 members on the mailing list for this newsletter to let them know that the 25th April issue was available I received a number of emails from members concerned that the links in my email had been tampered with. They were right - although in this case the tampering had been done with the best of motives, presumably by the member's ISP. Although there are fewer spam emails arriving in my inbox this month than in recent months, they are still predominantly from people with Yahoo addresses. Gmail still seems to be the safest option. Facebook isn't a site I use or recommend, but I know that a lot of members have Facebook accounts - so I thought I'd better pass on this warning. Researchers at Rutgers University have discovered that Hotmail addresses can be reallocated to someone else as little as 9 months after they have become inactive. Like many websites Facebook allows users to reset their password by submitting their email address - so in theory it's possible to gain access to someone else's Facebook account by becoming the new owner of a Hotmail address they no longer use. The researchers gained access to 15 Facebook accounts belonging to other people before abandoning the research because of the ethical and potential legal problems - they estimate that up to 1 million Facebook accounts could be vulnerable. Indeed, someone could even get access to your LostCousins account using the same technique but it's far less likely because - unlike Facebook - we'll only send an automated password reminder to your primary email address. Still, it's another good reason to update your My Details page when your email address changes - and to avoid using Hotmail (which is often targeted by hackers). According to the New Scientist article which reported this research Google have confirmed that Gmail addresses are not recycled, so it's another reason to choose Gmail if you need a webmail address. One of the first things I did when I started researching my family tree more than a decade ago was to buy a book called Ancestral Trails by Mark Herber. Even now I still refer to it from time to time, so when I saw that I could get a nearly new copy of the 2nd edition, published in 2005, for around £8 including postage I jumped at it (the book has 870 pages and weighs several pounds). I've always been pleasantly surprised by the condition of the used books I've bought at Amazon - and sometimes the saving can be quite considerable, as it was in this case. I spent the gloriously sunny Bank Holiday weekend on the Norfolk Broads, which is a notoriously difficult place to get a mobile phone signal, let alone mobile Internet - but I was pleasantly surprised to find that having switched to GiffGaff I now get a signal when my wife (whose phone is still on Orange) doesn't. I'm also paying a lot less than she is - for £10 a month I get 250 minutes of phone calls (more than I can possibly use), unlimited texts, and 1GB of mobile broadband (very generous). But for me the most important feature is being able to turn my phone into a Wi-Fi hotspot so that I can use my laptop - most mobile phone companies don't allow 'tethering' (in fact, even GiffGaff don't allow it on their unlimited Internet plans, which start at £12). It's worth checking whether your phone can be turned into a Wi-Fi hotspot - if it's a smartphone there's a good chance that it can. And if you're tempted to try GiffGaff, click here to get a free SIM and £5 of free credit with your first top-up. Incidentally, GiffGaff came top - by quite a margin - in this month's Which? magazine survey of pay-as-you-go providers, so it's not just me recommending them. Regular readers of this newsletter will know that I sometimes write about stamps. This week Royal Mail released a set of stamps called Football Heroes, and I was absolutely appalled to see the picture of England's World Cup-winning captain, Bobby Moore - it looks nothing like him! I won't say that I could have painted a better likeness myself - but I bet there are plenty of LostCousins members who could have done. Although Bobby Moore is one of my sporting heroes I never met him, although I came within a few feet of him on many occasions - not on the football field, of course, but in the pub he ran after his retirement. I've altered the article about Aberystwyth Crew Lists to make it clear that the images aren't currently available online. If you're one of the lucky members invited to join the LostCousins forum prior to the official launch, why not head off there now to vote on your favourite artices in this newsletter? I hope you've found this newsletter interesting and that you'll make full use of your membership of my site to link with the cousins you don't yet know (your 'lost cousins'). After all, that's what LostCousins is all about!